Ambra, she may be a healer, but don’t think she’s soft – cross her on the battlefield and you’re gonna get burned. Or get a meteor dropped on your head. Or both. Why is this badass healer so unique? Let’s find out. The Jennerit aren’t exactly known for being nice. In fact, because of their…let’s just say flexible ethics… Ambra (she’s a lot older than she looks) can come off as some magical evil mastermind at times. Her fits of malevolent laughter probably don’t help, either. That said, she is actually one of the good guys. She’s idealistic, optimistic and believes wholeheartedly in the beings she’s fighting alongside to save the last star. Ambra was betrayed by Rendain and his coup within the Jennerit Imperium. 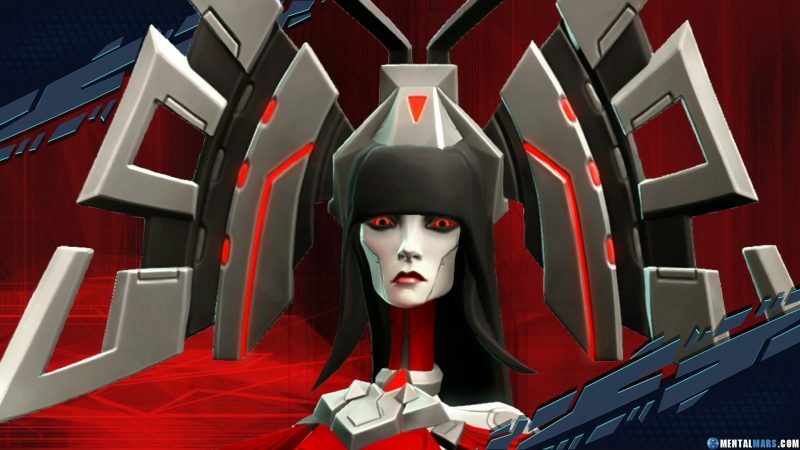 Now, she fights with the Battleborn to heal her people and restore order through localized solar anomalies – preferably launched at Rendain’s face. Before Ambra officially was announced i spotted her in a trailer, based on that i did some speculation on who she might be. Ambra’s Staff of Radiance drains health from a targeted enemy, returning 30% of the damage dealt to herself and generating Heat. Ambra unleashes a series of melee strikes, spending Heat to do up toe 100% extra damage per hit. Heat strikes lower the cooldown of Sunspots by 1 Second. Summon a Sunspot that does 42 damage a second to nearby enemies and 64 healing to allies at the cost of its own health. Up to 2 Sunspots can be active at once. Channel a fiery wind that quickly builds Heat as it damages enemies in front of Ambra. Solar Wind does 85 damage per second for 3 seconds. Calls down a meteor at a targeted location, dealing 359 damage and leaving a scorching area of effect, dealing 53 damage for 5 seconds. When Ambra’s health falls below 20%, she is protected by a Flame Shield for 4 seconds that provides 300 Overshield. During the course of a gameplay session your Battleborn will earn experience points by taking down enemies or complete challenges. By earning enough XP Points your Hero will level up and gets presented a choice between two different augmentations in the Helix skill tree. Per level you can only choose one of these skills to enhance your character’s abilities. Ambra’s Staff of Randiance can be used to transfer health to a targeted ally at the cost of her own life force. Health cost is -30% of healing done. Ambra’s Staff of Radiance can be used to fuel a Sunspot, strengthening and replenishing its health. Enemies hit by Solar Wind are blown away, being repeatedly pushed back. Replaces Solar Wind’s directed channel with two slams to the ground with Ambra’s staff. Enemies all around Ambra are pushed back with each slam. Transforms Ambra’s Staff of Radiance into a spear, capable of releasing all of its built up Heat in a singular devastation impact. When Heated, Ambra’s Staff of Randiance transforms into a halberd that fires condensed Heat in the form of explosive minor-novas. Ambra’s Flame shield’s cooldown has timer in the bottom right of the ability section of the HUD. Heal yourself for 24,000 health using the Staff of Randiance’s health drain ability. Deal 28,000 damage with Scorching Strikes. Kill 100 enemies with Solar Wind. Heal teammates for 50,000 damage. Deal 60,000 damage with Extinction Event. Ambra’s legendary gear is rewarded to the player when all lore challenges are completed. We wish to congratulate you on the induction of your newest novitiate, Claudia Ambralia Divia, today on the twentieth year of her Birth, and also now her Sustainment. We continue in our pleasure of your oversight of the Order of the Sustaining Mother, and your hand in taking young well-born females of the Empire and grooming them for a long lifetime of service to our people. We believe Ambralia to be an exemplary candidate. Her matronly, abrupt nature will serve as a benefit to your order. We do not expect to hear any more concerns regarding Ambralia’s sharp manner and her interest in galactic politics. Rather, we expect to hear of the successful integration into your order. To this end, we have crafted a new Vow for your Sisterhood, a creed to help your order maintain focus as we seek to defray the death of our stars. We are the Daughters of the Empress, our Sustaining Mother. Sustainment is her gift to us. To the Empress and to her Gift we now willfully bind our lives. Our Service shall become our victory. This Precept will we Uphold. This Precept will we Sustain. [Ambra] Any deed, any price. [Ambra] It is… It is good to be alive. Thank you, Cal. [Visitor] Kemessian. Just call me Kemessian. [Ambra] Yes, there is definitely a mess on that armor of yours. [Visitor] How are you feel… wait, what? [Ambra] A mess. I know you Shock Troops are fond of, what do you call it, “Splatter Shine”? As proof of dramatic landings? Well, it’s simply muck, and there’s mud all over your legs. How is it you were even ALLOWED to enter the med facility? I MUST be out of my more-than-sufficient MIND to have come here for recovery, and now I am greeted by… this?! // LOG TERMINATED; PATIENT RECORD NOTED AS “IN GOOD HEALTH”. Rulers of our Noble Accord: I, Claudia Ambralia Divia, hereby wish to address a most disturbing division within our Empire. Empress Lenore and Warmaster Rendain have, in their directives to our people, crafted a crisis which threatens our future survival. I am, of course, speaking of the Passage: the rather dark arrangement in which Rendain aligned the Imperium’s destiny with that of the Varelsi. Citizens of the Imperium know, and have seen, the work of the Empress and her Warmaster in pursuit of this goal. For my part, I have diligently performed the duties of my office in support of the Empress’ objective, working tirelessly to secure our safety after the universe’s end. However – it is simply unthinkable that our Sustaining Mother, our Empress, would allow the wanton degradation of our proud and storied Imperium, such as we’ve witnessed since Rendain’s rise to power. The discarding of our most treasured rituals and traditions, the outright dismissal of the ceremony of Sustainment… these crimes are grave enough on their own! But then the Lord Commander brought a beast to state functions – the lapdog he keeps at the ready to calm his terror-stricken subjects. “Constable Cuddles”, I believe it’s called. And while I can not deny the utility of such a companion, I must nonetheless object to its inclusion in matters of state. The wretched thing SHEDS EVERYWHERE, and the yapping is a CONSTANT INTERRUPTION! And, what if… oh, heavens… what if it were to… PIDDLE upon the floor of the Great Hall? No! I can tolerate this no longer! Regrettably, I’ve chosen to resign my position! In addition to the reasons listed above, I’ve also prepared a brief, citing the numerous Articles of Order and Propriety, adopted by the Silent Sisters in oversight of these matters, violated in due course of the Lord Commander’s reign. I offer you my skills and knowledge for your campaign now referred to as the “War of the Last Star”. As I have commanded stars, I believe your endeavor will only succeed with my presence in a leadership role. I’m glad to hear that you’re with us. I have you assigned as support for a team investigating power fluctuations on Bliss. Galilea personally requested you for this assignment, and says you two have a strong working relationship. I believe you have incorrectly assessed my skills. As a capable Silent Sister and as a Jennerit Sustained, I command the VERY STARS themselves. I demand reassignment as leader of an assault team on Tempest, where I am both familiar with and motivated for battle. Also, Galilea is a liar. I have, as part of your personnel profile, footage of you repeatedly bombarding scalewolves on Ekkunar by hurling… “meteors” at them from low orbit. While giggling. I do appreciate your talents, and feel they will be best served on a planet that can contain your “fire” for battle. Galilea will be leading the expedition. If you wish to fight as part of the Battleborn, I expect to see you on the moon in three days. First, the scalewolves in the aforementioned video were threatening local indigenous species, and required extermination. Let your records also indicate that the scalewolves were far tastier than their prey, the adorable haresburras. Second, Galilea is an uncouth and uncivil purple-skinned Helician devil and tell her that I will NOT be speaking to her during the mission. Any command she wishes to give me can be transmitted through an agreed-upon third party. Your fondness for furry woodland creatures is duly noted. Galilea would like to convey that she is also not speaking to you, and that you can “Sustain this”. Look, I better not have trouble from you two on the mission. I’m still keeping my haresburra. …and as is suspected, the Solarius Staff is not simply a ceremonial instrument, but a highly advanced bit of technology that acts, if I may be so crude in my comparison, as an entry key to the Jennerit Sustainment chamber. The Solarius Staff, among other uses, allows its wielder to call forth small gravity wells with pinpoint precision. These wells are capable of short bursts of immense gravitational pull, and at times can be positioned to pull small satellites from orbit.